Did you catch the five previous posts? If not, go here, here, here, here and here. Saturday -- our last day together at Harlingen's annual birding festival -- brought a definite change in the weather: much cooler, brisk, even chilly. My roommates, Catherine and Sharon, teased me for my Southern Californian intolerance for cooler temperatures, so I wore layers before we made another pilgrimage to Alicia's Mexican Restaurant. 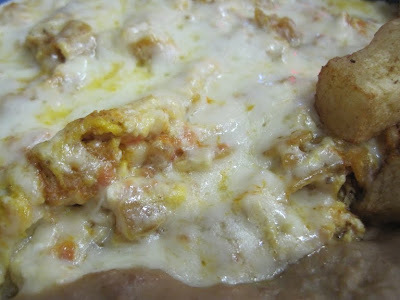 Behold, my chilaquiles! 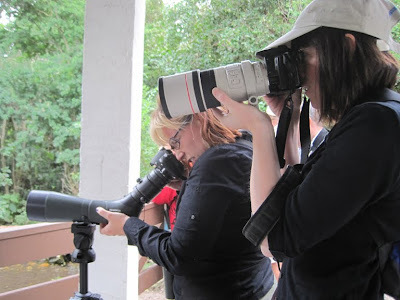 Then we set off east for Laguna Atascosa National Wildlife Refuge -- and the promise of Green Jays. I have no shame in declaring a fondness for these colorful birds that keep me riveted to the refuge's feeding station. See the small sign about paying the visitor fee? You can forego that fee if you show a Duck Stamp to the ranger inside the visitor center. 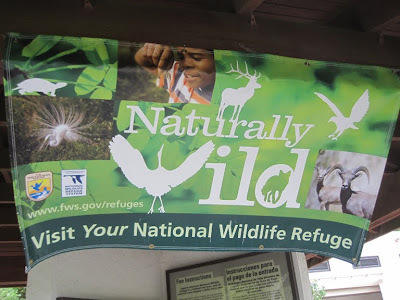 That $15 stamp allows for free access to NWRs across the United States between July 1 and June 30 -- quite the deal... and an excellent way to fund habitat conservation for waterfowl and other species. Catherine and Sharon aimed their optics at the birds and clicked away. The Great-tailed Grackles did a superb job of shooing the jays from the feeders, much to my chagrin. As much as grackles amuse me, I wanted to focus on the Chara Verde, thankyouverymuch. 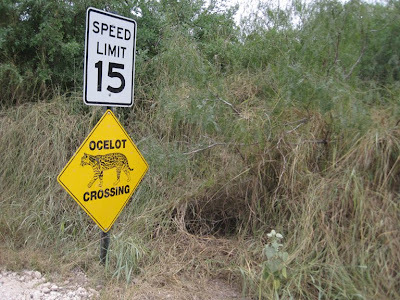 Endangered and thought to be down to 50 animals, ocelots desperately rely on the habitat at and around Laguna Atascosa. During the festival, some very lucky birders saw an ocelot at the refuge, and the rangers wisely restricted access to the area for the small cat's protection. If the ocelots' status piques your interest, consider attending the Ocelot Conservation Festival in May 2011 or adopting an ocelot. As we slowly drove the asphalt, we occasionally stopped to peek more closely at the birds. Sometimes optics sufficed for the closer look, and other times, a stretch of the legs yielded better views. 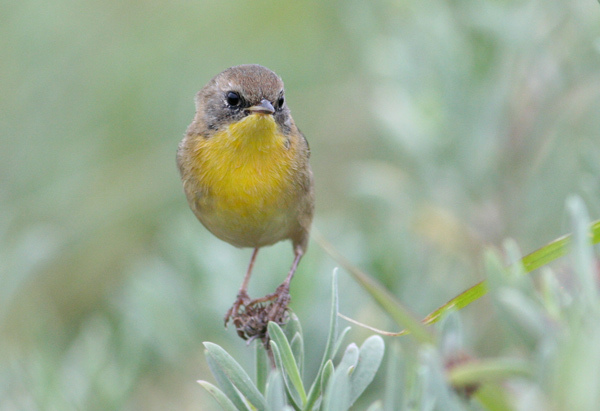 Some birds posed next to the car, such as this Common Yellowthroat photographed by Catherine. The other species I enjoyed seeing include Pied-billed Grebe, Northern Harrier, Osprey and Crested Caracara -- a good number of 'em. Sharon digiscoped one atop a palm as it preened. Harris' Hawks, spied along the drive west to Harlingen, served as my final species during this visit to the Rio Grande Valley. 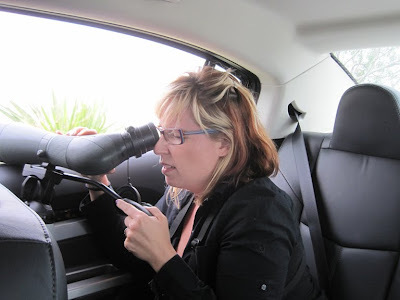 The trip ended too soon for my taste, so I left on Sunday still with an appetite for more birds, birders and Alicia's food. My next visit can't come too soon! Sounds like you had a great time. One of these years I'm gonna get there! I'm reading this at 4:30 AM and you start the post with a glorious breakfast I can't have. Nice. You won't regret attending the festival, Connie. It's well-run. You know how I like to take food photos!